Appropriate antibiotics, which first became available in the 1940s, are the only effective way to treat typhoid. The disease, however, is caused by a fast-learning, quickly-evolving bacterium that has developed defenses against these drugs. The rate of typhoid cases resistant to available antibiotics is increasing globally. Even as we develop new, improved antibiotics that are effective against typhoid bacteria, resistance to those antibiotics is growing more prevalent, particularly in low- and middle-income countries where accurate diagnosis and appropriate treatment are difficult to access. This has resulted in the emergence of a new form of superbug: multidrug-resistant typhoid. Multidrug-resistant typhoid, defined as resistance to three first-line antibiotics used to treat typhoid—chloramphenicol, ampicillin, and cotrimoxazole—first appeared in the 1970s and has since spread globally. 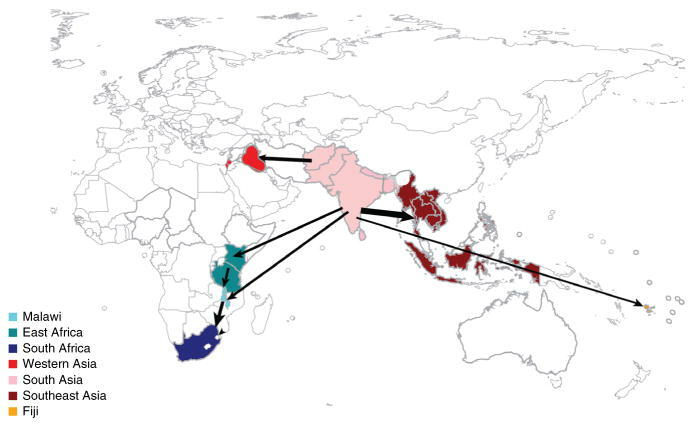 Of particular concern is a multidrug-resistant strain of typhoid called H58, which is increasingly being identified in many parts of Asia and sub-Saharan Africa. The map below, created by the Wellcome Trust, shows the major geographical transfers within the H58 lineage. Research from the Wellcome Trust illustrates the spread of multidrug-resistant typhoid in Malawi, where only 7 percent of typhoid cases were resistant to multiple drugs in 2010. 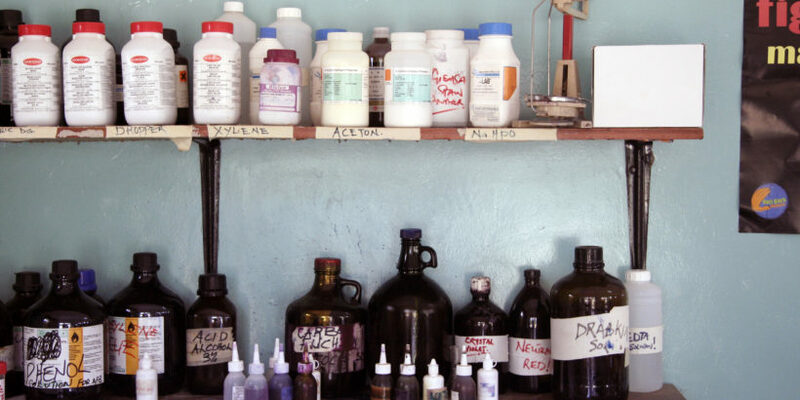 By 2014, 97 percent of typhoid cases resisted treatment from multiple drugs. Typhoid also shows increasing resistance to fluoroquinolones, the preferred antibiotic for treating multidrug-resistant typhoid since the 1990s, and to some third-generation cephalosporins, which are costly and difficult to administer. This makes these antibiotics less suitable for use in low- and middle-income countries. These super strains are forcing the use of more expensive and less readily available antibiotics, placing greater costs and pressure on public health systems in low-income countries. When effective antibiotics are unavailable, typhoid becomes untreatable. Currently, if left untreated, 20 percent of typhoid cases are fatal. Fortunately, we have proven prevention tools to take on drug-resistant typhoid. By protecting children before they are exposed to typhoid, we can prevent infection and, therefore, reduce the need for antibiotics. When typhoid is unable to spread from person to person, it is unable to evolve. Increasing typhoid drug resistance raises the urgency for preventive measures such as vaccines and improved water, sanitation, and hygiene. Click the links to learn more about typhoid prevention and advocacy actions to take on typhoid. Efforts to prevent drug-resistant typhoid represent part of a large global effort against all forms of antimicrobial resistance (AMR). The World Health Organization (WHO) is leading the global conversation on AMR. In 2015, the World Health Assembly (WHA) endorsed a global action plan to tackle AMR; the action plan focuses on prevention, surveillance, and research. As part of the WHA resolution, all member states were urged to develop, and have in place by 2017, their own national action plans to combat AMR. Additionally, WHO has released an updated list of critically important antimicrobials and has provided new advice on antibiotics in the 2017 revision of WHO Model List of Essential Medicines. This work is to ensure that all antimicrobials are used appropriately and prudently.